By classical I mean the series returns to the roots of the first film, where humans paid for the hubris of playing creator in reformulating the extinct dinosaurs. As directed by J.A. Bayona (“A Monster Calls”), this Jurassic has well tuned tributes to “King Kong,” “Citizen Kane” and Steven Spielberg, revealing a compelling story that brings the dinosaurs off the theme park island and back to a civilization that never needed them in the first place. The theme of ravaging the delicate balance of nature is exposed, and mixes the strengths of characters from the first film – portrayed by Chris Pratt and Bryce Dallas Howard – with cameos from Jeff Goldblum and B.D. Wong of the original 1993 film. 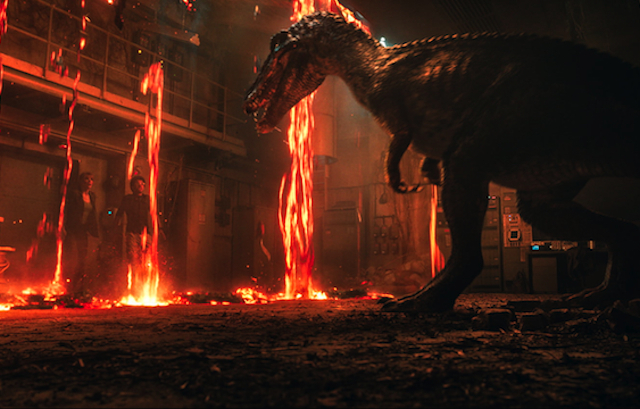 It all works, it’s damned entertaining and the story (by first reboot director Colin Trevorrow and Derek Connolly) is multi-layered and luxuriously textured. Three years after “Jurassic World” has taken its toll, the number of lawsuits and congressional hearings bemoan the fate of the former theme park, which featured hyper-genetic recreations of dinosaurs, and ultimately never should have reopened. Meanwhile, on the abandoned island that hosted the park, the dinosaurs are contained and threatened with a new extinction… a volcano that is about to erupt. A dinosaur advocacy group is led by Claire (Bryce Dallas Howard), Jurassic World’s former Operations Manager. They get involved when a billionaire named Lockwood (James Cromwell) – who originally helped develop the dinosaur gene replication – and is willing to bankroll a return to the island to retrieve a rare Velociraptor, the key to a new realm of species. 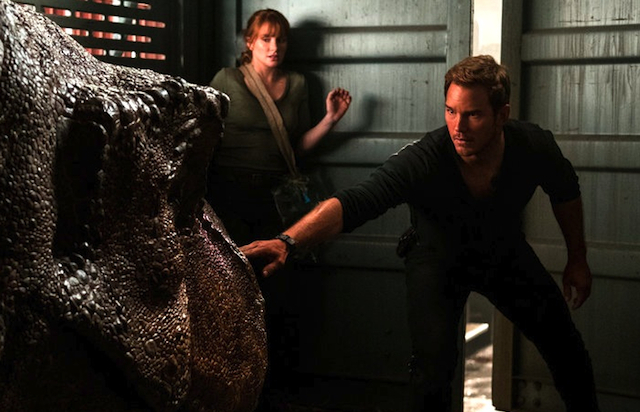 Claire recruits former dino trainer Owen (Chris Pratt), paleo-veterinarian Zia (Daniella Pineda) and computer hacker Franklin (Justice Smith) to infiltrate the old park, but they soon realize that they are pawns in a bigger game. This film was a throwback to the black and white shadings of the early studio films that explored humans versus nature. There are definite shades of the original “King Kong,” as the crew kidnaps the beasts from their natural habitat and brings them to “civilization.” The perils of the island volcano – which erupted spectacularly – also symbolized the first extinction of the dinosaurs, another instance of nature taking care of what needed to be, a theme that is a thread in the entire film. The billionaire’s home felt intuitively like “Citizen Kane,” where a man seeks to control his own destiny through his fortune. There is a grandchild of the house named Maisie (Isabella Sermon), who was a nice touch, again honoring the plucky children in Steven Spielberg movies that figure out more than their adult counterparts. Isabella Sermon is perfectly suited for that role, and she’s also cared for by Iris (Geraldine Chaplin, the daughter of the legendary Charlie) in a movie throwback to the old, scary and mysterious housekeeper. This is a fairly straightforward evil versus good story, and most of the evil came from greed. Toby Jones makes a memorable appearance as Eversol, the auctioneer of dinosaurs, and you know that’s not going to end up favorably for him. Chris Pratt and Bryce Dallas Howard have much more adventure to latch onto over the first film, and 25-year-anniversary nostalgists of the first film will get a kick out of Jeff Goldblum, who is in a late career surge that is nothing sort of epic. There is plenty of dino-”might” with the ancient animals, but in this one they are less used as predators and more as fellow travelers. If they are to roam, the film is saying, then let them roam with us. If you have any idea of how that works when we all live in a Jurassic World, well, another sequel awaits for another season. Happy Summer.